The International 4 Compendium was released on May 10, 2014 for $9.99. Valve really went all out with the new Compendium which includes some new features which can be earned either by leveling up or when stretch goals are met. There are a few ways to level your Compendium, like picking your favorite team for The International, your favorite player or by watching matches. Believe me you will want to level this Compendium because there are some very awesome rewards in this Compendium, a new courier, Lt. Squawkins, a custom blink effect and Immortal treasures and even some custom loading screens! Also there is no maximum level for your Compendium. Every 10 levels nets you an Immortal Treasure and for every 100 levels gets you an extra 100% on your Battle Point Booster. Awesome? You bet it is. The stretch goals also have a different reward every time a goal is reached, for every purchase of the Compendium you donate $2.50 to the prize pool. As of writing this article the prize pool is up to $4.6 million! List of rewards for every stretch goal achieved. $1,800,000 The International 2014 Battle Point Booster , Battle Point bonus increases as the compendium levels up. $2,000,000 54 Portfolio of Heroes Triumphant. Extra copies available as rewards based on Compendium levels. $2,200,000 Unlocks the ability to vote on which hero should receive the next Arcana. $2,400,000 Grants a new Compendium-themed HUD. $2,600,000 Unlocks the ability to vote on the participants of an 8 player Solo Championship at The International. $2,900,000 Unlocks the All Random Deathmatch game mode available to all players. $3,200,000 Grants a Treasure containing Valve created Immortal Items. Every 10 compendium levels grants you an extra Treasure. $3,500,000 Grants access to special emoticons that can be used in Dota 2 chat. $4,000,000 Grants a special Mini Pudge courier. Level 50 compendium owners have an alternate skin. $4,500,000 Grants a new music pack for Dota 2. $5,000,000 Unlocks a 1v1 only-mid-mode Match-making option available to all players. $5,500,000 Grants new environment effects in the Dota map. 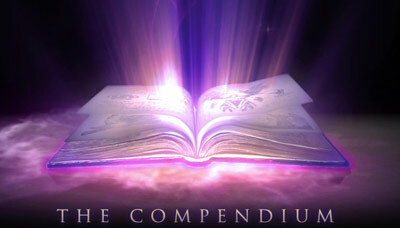 $6,000,000 Grants an item that allows Compendium owners to customize a building in their base.